A man becomes a monk in response to a call from God. This call, or vocation, is a free gift, given to whomever God chooses, not because of anything someone has done nor because of anything he is in himself. God call, God’s invitation, is offered to many different kinds of people. An attraction to a life of prayer and contemplation, a desire to dedicate oneself completely to God, a pull to the idea of monastic life that won’t go away… these might be indicators of a vocation. An inquirer or candidate will be helped to discern if this is really a call from God. 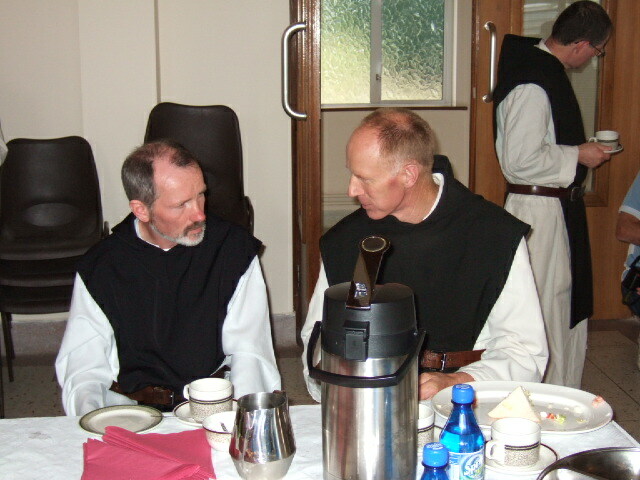 He will contact the vocations director, talk with him, and keep in touch with him over a period of time. He will visit to the monastery and spend some time living in the community (the length of time can vary according to the person’s circumstances). He will pray earnestly for the guidance of the Holy Spirit, open to the grace of God. – is the person truly seeking God? – does he show eagerness for the Work of God? – has he a willingness for humble obedience, and the capacity to accept the hard and difficult things which we inevitably meet on the journey to God? If accepted to join the monastery, the first several months are spent as a postulant, learning the basics of life in this monastery. The next stage consists of two years as a novice – an apprentice monk – learning through the example and teaching of the experienced monks, and beginning to practice the monastic craft himself. At the end of this time, if he himself freely requests it, and if the community accepts him, the novice professes vows of obedience, conversatio morum or fidelity to monastic life, and stability. This profession is made first for a temporary period (at least three years), and then permanently, binding until death. Have you considered that God might be calling you to monastic life? If you are a single man, a practising Catholic, aged between 25 and 45, with good health of mind and body – please take some time this week to reflect on it prayerfully. Our way of life demands great generosity and renunciation of oneself; its fruit is deep joy and peace.